Our goal is to help you discover which one of these GermGuardian air cleaners is the right one for your home. Unfortunately, when looking at the manufacturer’s website it’s hard to tell how each of these air cleaners actually compare to each other. Each product is equipped with a 3-in-1 air cleaning system, as well as other similar features, but unless you use look into the fine details, you may not be able to spot the differences. Below, you’ll find an outline on how each of these air cleaning products are the same and how they’re different. Knowing the pros and cons of each GermGuardian model will help you to easily pick the product that’s best for you, while saving you time and money in the process. When you’re looking to buy a GermGuardian air purifier that falls within the 4000 and 5000 series there are multiple features that you’ll enjoy no matter which product you choose. Each one of these air purifiers comes with a fan speed control. 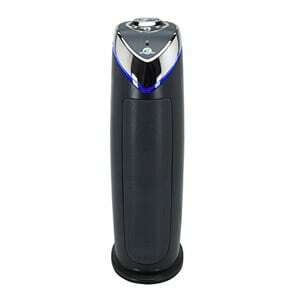 This enables you to adjust the air cleaning level to suit your specific needs. The low setting is ideal for nighttime use in a bedroom because it provides the quietest operation. Medium mode is best for continuous use throughout the day and the highest setting is best to use when a major flux of airborne contaminants enter into a room. This includes everything from a smelly pet, to cooking odors, smoke, an open window or door that allowed pollen or other allergens to come in, etc. Note: Each GermGuardian air purifier model offers a different set of fan speed control levels (3 or 5). This specification is outlined in the section on product differences below. All of these air purifiers hold the Energy Star Certification and meet strict guidelines set by the United States Environmental Protection Agency. This ensures that no matter which product you choose, you’ll have an air cleaner that’s energy efficient and cheap to operate. Each air purifier comes with a limited lifetime warranty and free support. This gives you confidence that your GermGuardian air cleaner will continue to meet your needs without any hiccups. Note: Each model comes with a different warranty time period, either 3 or 5 years. This time period is outlined in the section on product differences below. 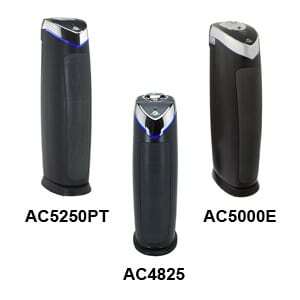 Now we come to the most helpful part in this review – AC5250PT versus AC5000E vs AC4825. What you’ll find below is a detailed list of the features and specifications that set each of these GermGuardian products apart. This side-by-side comparison should help you figure out which air purifier will suit your needs. 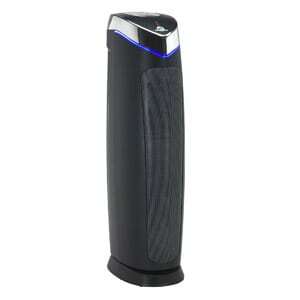 This air purifier is your next best choice and is featured on our list of the top 10 highest rated air purifiers. The AC5000 looks identical to the AC5250PT, but doesn’t include as many features. It’s also a great product for those of you who are looking for help with removing mold from your home. 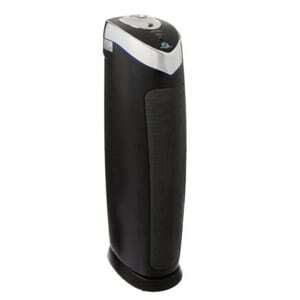 Find out more about this mold removal air purifier and what it can do here. If you live in a small apartment, studio, or loft, you’ll be happy to know that this is also one of the best apartment air purifiers you can buy. This air cleaner is also a popular choice among consumers, however once you see how its features compare to the other two models above, you may think twice before getting it. The AC5250PT and AC5000E provide the same air purifying power. You”ll enjoy the same quality of clean air regardless of which device you choose. The major features you’ll be giving up by choosing the AC5000E over the AC5250PT include the pet pure antimicrobial treatment, digital controls, a programmable timer and 2 additional fan speeds. These features are a nice bonus, but not a must-have for every homeowner. The AC5000E can save you $50. The AC5000E and AC4825 cost the same on Amazon.com, around $99 new. The AC5000E is a better buy because it purifies a larger space, includes a filter change indicator and a longer warranty.